With September approaching, rumors about upcoming Apple event and next generation iPod lineup have started to gather momentum. 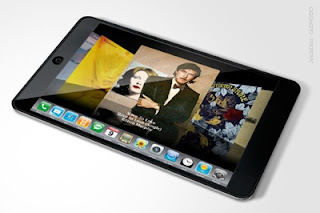 The latest news suggests that Apple will have a press event on 7th September to launch the new iPod lineup. 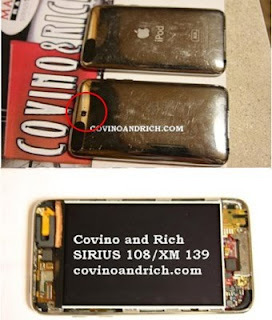 Many blogs have also posted images of upcoming iPod touch and iPod nano cases. For past few months the flow of Apple tablet related rumors has been pretty steady about 1 or 2 rumors per week, but in last 48 hours the blogosphere has gone bonkers with Apple tablet rumors. Every other website or analyst is claiming that some source has provided them information about the new device and Apple’s plans for launching the new device. Brain Lam of Gizmodo was one of the first bloggers to post about the latest Apple tablet rumors. He said a reliable source of his has held mock-ups of 10-inch screen device, which is like a giant iPhone with black back. The device will come in two editions, one with webcam and one for educational use, and it will cost $700 to $900. Lam further added that the project was in development for about four to six years but the first prototype was built in 2008. He expects that the device will be released this holiday season. AppleInsider published the same rumor from Gizmodo, but maintained that the device will not be available until early 2010, which they had reported earlier. AppleInsider also posted two videos from YouTube that claimed to be of a development kit for Apple tablet. However, even AppleInsider believes that those video are not true and noted that they were included for “discussion purposes only”. The Apple tablet fight was 3 to 1, but then the news came that Apple is shooting a commercial for an unreleased product at a diner in Truckee. 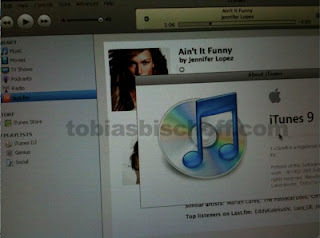 Which suggested that the unreleased product might be new iPods or the rumored Apple tablet. If Apple is shooting the commercial for Apple tablet the device will be released soon, because Apple won’t shoot a commercial six months in advance for a product they might release in 2010. After hearing all these rumors we contacted our sources, and they were also not sure about the release date for Apple tablet. 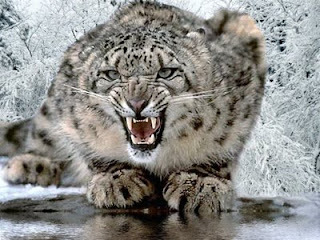 In fact two of our sources said its coming in September, one said its coming in November and other two said its coming in first quarter of 2010. One thing they all agreed on was that inside Apple also there is confusion about planned launch date for the new tablet. It looks like it’s just Steve and few top ranking people at Apple who really know when we will see the Apple iTablet (or what every they will call it). Microsoft today announced that Zune HD is now officially available for pre-order on Amazon, Best Buy and Zune.net. The 16GB model will come in black for $219.99 and the 32GB model will come in platinum for $289.99. 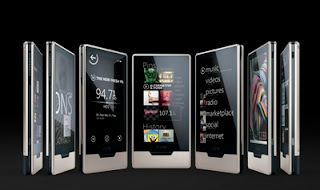 Both the Zune HD models will ship on September 15th. Gartner has released the worldwide cellphone market share report for Q2 2009. The mobile phone sales declined 6 percent, but the smartphone sales grew 27 percent during the period. 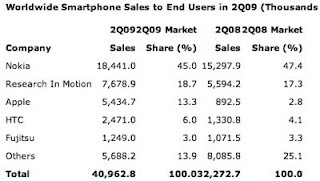 In smartphones Nokia came in top but their market share dropped from 47.4 percent in Q2 2008 to 45 percent in Q2 2009. RIM saw 1.4 percent jump in market share, which brought their number to 18.7 percent. Apple saw the biggest jump from 2.8 percent in 2008 to 13.3 percent in Q2 2009. Unit shipment jumped 500 percent for Apple from 0.892 million to 5.4 million. Intel will be shipping 32nm process technology based chips this year, but the company plans to move to new ‘Sandy Bridge’ microarchitecture, which will succeed Nehalem in Q4 2010. 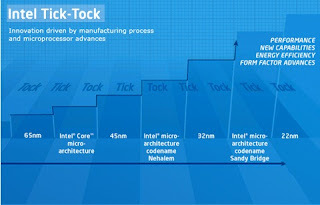 Intel will start volume production of 32nm based chips codenamed Westmere in Q4 2009, and plans to introduce Clarkdale for desktops and Arrandale for notebooks in first quarter of 2010. Intel and Micron today announced the development of a new 3-bit-per-cell (3bpc) multi-level cell (MLC) NAND technology, leveraging 34-nanometer (nm) process technology. 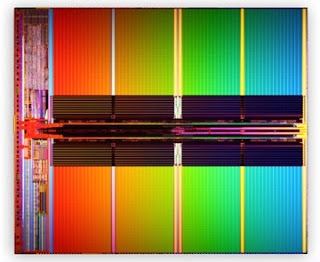 Using the new 3bpc technology Micron has produced industry’s smallest and most cost effective 32-gigabit (Gb) NAND flash chip. The 32Gb NAND chip is just 126 square millimeters in size. The social networking integration that we reported iTunes 9 would have seems to be part of bigger social networking push by Apple. We’ve been informed that Apple has plans to tie iTunes 9 into a “Social” application that they plan to release in the future. Gizmodo has posted images of Best Buy inventory system that shows the price and release date for upcoming Zune HD media player. The 16GB model is listed for $220 and the 32GB model is listed for $290. 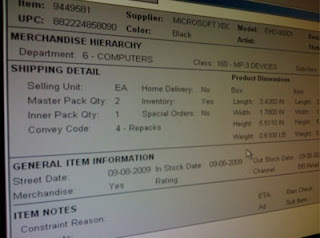 According to the inventory system, Zune HD will be in stock from September 8th. In this section we will highlight the top tech stories of past week. Every Sunday we will publish links to top 10-12 tech stories that were published during the week not only on our website, but also on other websites. This week belonged to cameras as two new technologies were for the first time integrated with compact digital cameras. First it was Sony that added back-illuminated “Exmor R” Sensors to Cyber-shot WX1 and TX1 digital cameras. Back-illuminated CMOS sensors will make low light photography piece of cake for anyone who can hold a camera in their hands.